Crazy Culinary Crises - two in one download! Help Emily solve two culinary crises! 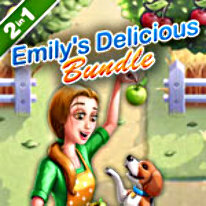 Whip up meals to get from Snuggford to Hollywood in Emily’s Taste of Fame! Earn enough money by catering to restaurant customers to open Emily’s Tea Garden! It's an addictive duo full of fun, love, drama, friendship...and food!